Meet the next generation of spin dryers! Customers who dye stuff and have lots of washing machine loads are really finding these things handy! Recommended also, as great for batches of hand washables, like silk and rayon scarves or yardage. Some use it for felting. And for the rest of you, who doesn't want to save money?! The energy saving is that the Spin Dryer removes most of the water that your washing machine doesn't, so substantially lowers (by 30 minutes or more) the time in the dryer. For those delicate items, you can get almost all of the water out before line or flat drying, without tangling or wear and tear. Silk scarves look best if ironed slightly damp, but they are too wet right out of a washer or bucket. And we have a great price. The new Nina comes with a tall, built-in handle that makes transport easier and keeps bending to a minimum. 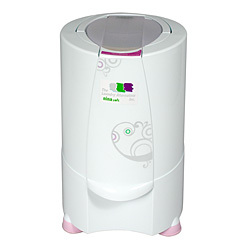 It is about 7 pounds lighter than the classic Spin Dryer and at 136W it uses even less power than the original model; which is extremely energy efficient to begin with. Fans of the classic Spin Dryer will recall the lever that has to be turned in order to secure the lid, each time, to switch the machine on and off. The new design eliminates the need for that lever! Simply close the lid and it automatically turns on. To turn it off, gently pull the latch and the lid automatically opens. It may be sorcery, but we won't tell! 1800 rpm spin speed - gets out WAY more water than the spin cycle on a washing machine! Dimensions: 14" x 14" x 24"
Much gentler on clothes than a conventional tumble dryer; Fantastic for hand washables - No tangling or fraying! Please note that this is a "spin dryer" which is not the same as a standard clothes dryer. It does not use heat. You put a bowl, pan or other type of receptacle underneath the drain spout to catch the water that comes out of the drain spout. drum before you start the machine. It prevents items, especially smaller ones like socks, from exiting the drum and potentially damaging the machine. You may see a metal bar underneath the machine attached by two zip ties; this is to securely fasten the motor for it's long trip overseas. Snip the zip ties and remove the metal bar before using the machine. If the zip ties are already cut when you get the machine don't worry - as part of their quality control the vendor tests random machines before they are shipped out. A Note on Shipping: This product incurs Dimensional Weight and will ship as if the fully packaged item weighed 38lbs. This is a Drop Ship item. We will place your order right away in accordance with the time lines of our Ordering policy. However, please be aware that the manufacturer may not be able to hold to the same rigorous standards due to a number of reasons - which may include time zone differences, an overflow of unexpected orders or just plain bad luck with employee health. When the order has been placed it may take a week or longer for the supplier to get products ready for shipping. Please call with any questions if you have a strict time frame that you are working with or deadlines to meet. **No returns on this drop ship item unless it is defective, sorry. Additionally, our supplier will not ship outside of the US but if you would like to get a Spin Dryer, and happen to live outside of the US, please call and speak with one of our customer support staff. I've had this in continuous service for nearly three years in my home spin-drying every single thing I wash for my family and I'm finally ready to replace it. It had become a lot louder as some of the plastic bits started to get chewed away (escaped socks when I forgot the cover unbalanced load slamming the passage of time...) and the lid mechanism broke a bit and started rattling around and then today the brake finally failed. It's still usable in its current state! Just a lot more annoying. I've been very happy with the machine and I think its lifespan was reasonable considering I've been putting this to very heavy use. Yes balancing the loads is a pain. I still get water all over the floor once in awhile as it tries to dance all over the place. But it does a really amazing job consistently. The clothes are slightly damp never wet. There's never tons of soap left on our clothing. We're saving a ton of electricity. I got this as a stop-gap when I got tired of repairing our ailing washer myself but to my surprise I quite enjoyed the soak-handwash-spindry process... so much so that when my husband suggests finally replacing the old washer I resist! I've used this for clothes blankets pillows (beware your warranty) woolens coats... even an afghan that I would never have trusted to a regular washing machine. Never had a complaint only that it didn't last another three years! This will pay for itself quickly in reduced electric dryer time! There is about a cup of water removed from each load of laundry! Plus it removes a huge amount of water from my handspun yarns and washed fleece. They now dry overnite instead of several days. Highly recommended. I bought this and it arrived today. I have been hand washing my clothes and wringing them out for months after I moved out of a home with a clean washer. Meaning it had never been used with scented laundry soap of fabric softeners. I am deathly allergic to such products. My Nina Soft seems to do well. It is a big improvement from hand wringing out my laundry. I was a little disappointed it didn't remove more water and wish I had gotten a different centrifuge. But that was for a heavy pair of sweat pants and tomorrow I will try laying them flat on the spinner wall one at a time to see if it creates maximum extraction. Don't get me wrong. Nina Soft extracts a lot of water and I would never discourage anyone from getting it. I used it at 6 pm tonight three hours ago and several shirts I hung up are nearly dry. The construction is great. The design is well thought out. Remember to remove the metal bar at the bottom when you open the package or you could damage the unit. It holds the motor in place during transport. I give this five stars. A very good product. We use one in the studio for classwork. It holds up well to heavy use from all of our fiber classes. Load balancing can be a bit troublesome though. I am please with this product. I have recently been simplifying and down sizing my life. To that end I decided to go with a hand washer and this spin dryer. It takes clothes from wet to near dry very quickly depending on the fabric. Fabrics like polyester come out essentially dry. Cotton comes out damp and dries in 6-12 hours when hanging in my closet. It's a bit tricky to load keeping it balanced and it doesn't hold more than about 4-5 tee shirts. Clothes tend to be slightly crispy when they dry even if you use fabric softener in the water since it spins most of the fabric softener out with the water. Overall I'm very pleased with this spin dryer. This is a great machine. I use it to get water out of hand washed items soapy water then rinse water. Dries fast even on line. I hate using big washer for single item or to prewash a few yards if fabric. It is getting a lot of use to spin the woolen sweaters after handwashing. I'm loving it as the sweater dries very quickly now compared to hand wringing and laying flat on towels to dry. This device is fantastic! I wash raw wool for my fiber crafts and this device helps my wool dry very quickly even in my rainy climate. My husband thanked me for buying the Nina Soft Spin dryer! He prefers to line-dry his clothes and using the Nina speeds the drying time noticeably. He has also used it after washing ball caps and hunting caps. Easy to use saves energy great for fiber work and oddball laundry items! Arrived quickly too! The spinner is great when dyeing. I get all the water out and need less water for the rinsing. I plan to use it for quilts too if not too big.In Germany spinners were used before we had a washing machine. If your washing machine doesn't get the water at well the spinner will. I love this thing! No more tie dye elbow!! This is the greatest machine. I love how simple it is yet it spins things out without damaging delicate pieces. I use it to spin out excess soda ash for easier and more effective tie dying plus you save both soda ash and dye in the process. Shipping was astonishingly quick!I have a small yarn dyeing business and use the spin dryer to speed up the rinsing process. As others have said the load has to be very carefully balanced but I'm getting better at getting it right the first time. I usually rinse 2 12 or 3 lbs. (dry weight) of yarn at a time. My only complaint is that the spin basket arrived with a t-shaped piece of the kind of foam comprised of small foam balls pressed together (polystyrene?). There was no way to remove the foam without leaving little foam balls everywhere. Weeks of use later I'm still seeing little foam balls in the rinse water. Strange packing aside the spin dryer works great!